The Simpsons has been on for a long time. A long time. Some might even say too long. On Sunday, we’ll get a very clear indication of just how long its been when Fox re-airs the very first full-length Simpsons episode as part of a mini holiday celebration in the lead-up to Christmas. The episode in question is “Simpsons Roasting On An Open Fire,” but we obviously didn’t need to tell you that because you’re reading this news on The A.V. Club and therefore you probably never stop thinking about The Simpsons as it is. The episode will air on Fox on December 23, 30 years from when it first aired on the network and helped turn Fox from a low-tier outlet for wall-to-wall trash programming into whatever it is now. It’ll be a real shock for Simpsons fans who have grown accustomed to what the show is today, as “Simpsons Roasting On An Open Fire” is a bizarrely straightforward sitcom episode about Homer struggling to afford Christmas gifts that was actually hand-drawn by human people (instead of computers) and doesn’t include a single distracting celebrity cameo—unless you count beloved Growing Pains guest star Hank Azaria. 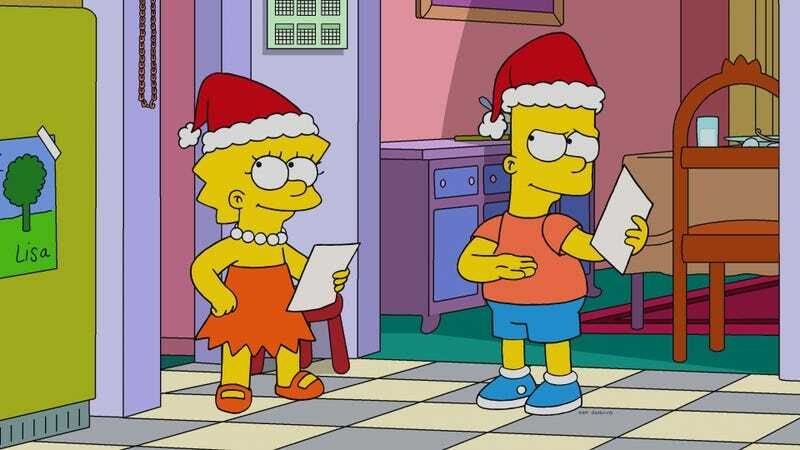 If you can’t possibly wait that long to see the Simpsons celebrate Christmas, Fox will be airing a brand new Christmas episode this Sunday called “Tis The 30th Season.” It’ll be about Homer and the kids planning a surprise trip to Florida when Marge’s Black Friday plans fall apart, so they’ve obviously come into some money in the last 30 years. Now let's all go out for some frosty chocolate milkshakes! The Simpsons (Classic): "The Simpsons Roasting on an Open Fire"